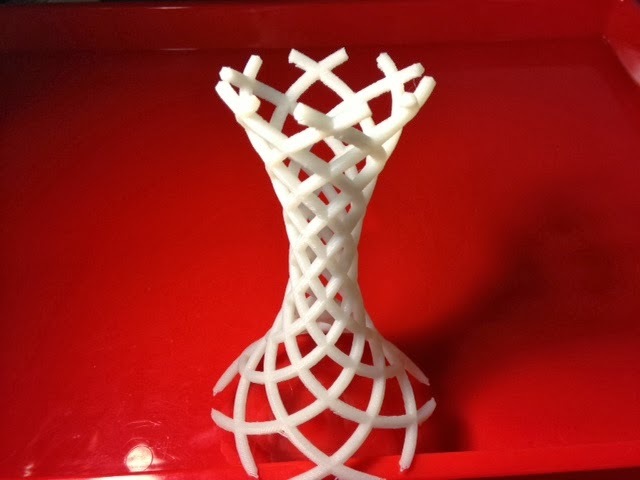 JamieLang's Wormhole Candle Holder is one of the most beautiful things I have seen on Thingiverse that is easily and reliably printable on a household fused deposition modeling machine. Its overhang angles are mild enough that no supports are necessary and the wireframe design cuts down on printing time and material. It fills up the vertical build area on my Afinia almost exactly, and even on low quality resolution settings this piece is stunning when printed. Settings: Afinia with .3mm normal and <10% support setting for minimal supports. Printed without any supports in 2 hours and 11 minutes. Stuff you might want to change: Since I wanted this piece as something fancy for my dining room table, I initially tried to print this at .15mm "fine" resolution and default supports, but the print time would have been over 13 hours so I backed off to something much faster for a first attempt. I love it just the way it printed but if I were to give this as a gift I would spend the time to print it at a higher resolution (but keeping the <10% support setting, which should save about a third of the time and material costs).